Are you still trying to slice kernels from cob with a knife? You know it is a messy and dangerous task right? Do you ever wonder is there any easy to do it? If you do a search on google, you will find there are many tools invented for it. And here, we will present you 7 Intuitive and Useful Tools we like that can help us enjoy fresh sweet corn right off the cob in an easy way. This Amco one-step coren kerneler easily removes kernels from the cob in one quick motion. Place the corn kerneler at the narrow end of the cob and press straight down to the bottom of the cob. All kernels will collect neatly and there’ll be no more kernel mess to clean up. It holds approximately 2 ears of kernels. To empty, pour kernels from the spout and start again. It is designed with a stainless steel blade that adjusts to the width of the corn and is top rack dishwasher safe. This handy kitchen tool quickly and easily strips kernals right off the corn cob, without any wayward messes or juice splatters. Just insert a fresh, frozen or cooked corn cob into the cylinder, press down the 18/8 stainless steel blade and the kernals come right off and are contained inside. 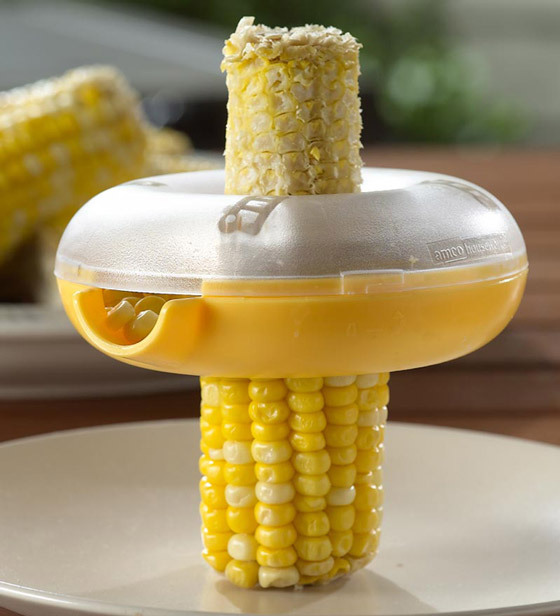 A great solution for anyone who enjoys corn on the cob in a more civilized fashion. 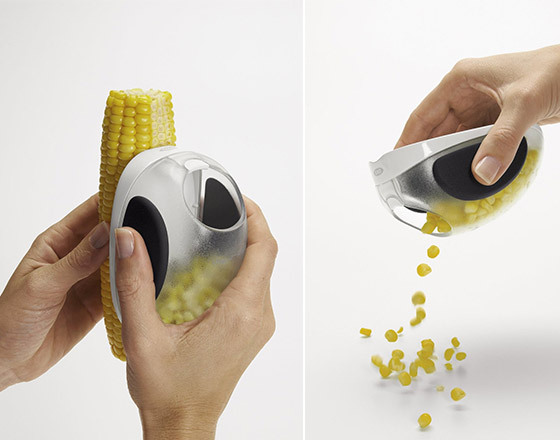 The OXO Good Grips Corn Stripper features a container that catches the kernels as they are stripped from the cob. Simply push the Corn Stripper down the length of the cob and the kernels collect in a convenient 1/2-cup capacity container (approximately one cob). Turn the cob and continue stripping until all kernels are removed. Kernels can be poured out of the top hole of the container into a bowl on onto a plate. The soft, non-slip grips cushion your hand during use and the stainless steel blade will not rust or dull. 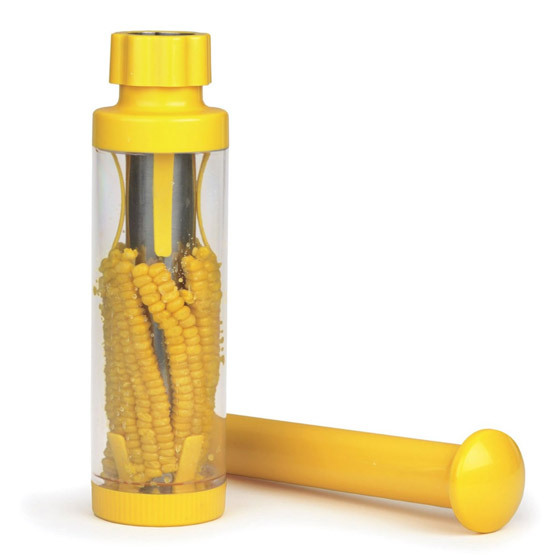 The Corn Stripper comes apart for easy cleaning and all parts are dishwasher safe. 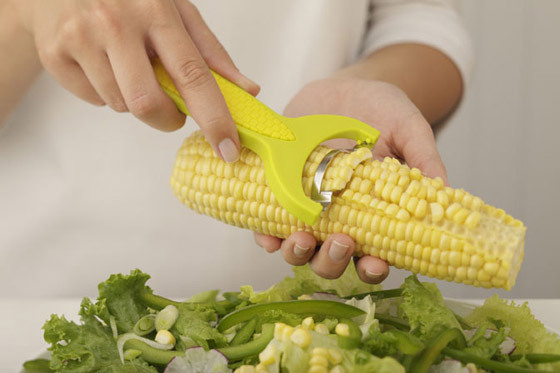 Zip kernels cleanly and effortlessly off the cob with the Kuhn Rikon Corn Zipper. Sharp teeth cut between kernels and cobs removing several rows at once. Safer than using a knife. Corn puddings with nothing but corn kernels and lots of butter baked until crusty on top are not far behind. The Zipper head is made of high quality stainless steel with a two-tone plastic handle is whimsical corn cob design Blade protector included to protect blade and hands during storage. Dishwasher safe. Corn Twister combine fun and ingenious functionality. The green husk lets you hold the cob steady as you push the corn cob into the metal corncob piece. Gently push the vegitable and twist it against the metal. The kernels quickly come off without mangling them. 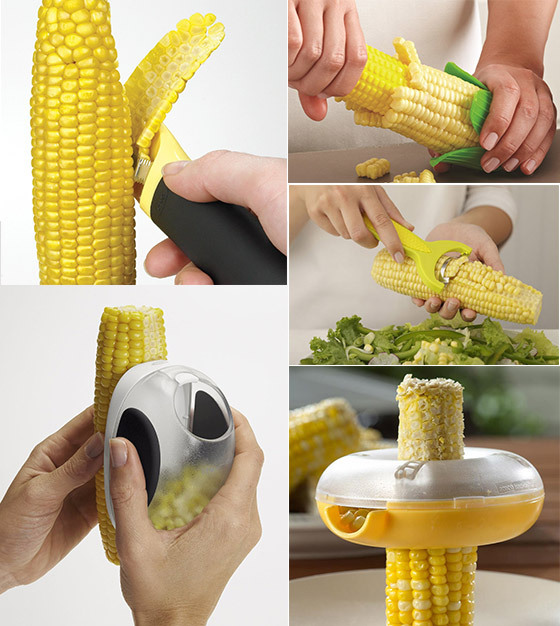 The Peeler safely removes multiple rows of kernels from corn cobs with a quick and simple motion. The blade is positioned at an angle to ensure perfectly cut kernels every time, eliminating the risk of cutting too shallow or too deep. The durable, stainless-steel blade is serrated on both sides, making it easy to use for both righties and lefties. To protect fingers when the Peeler isn’t in use, a cover snaps onto the blade. The soft, nonslip grip makes stripping a whole bushel of corn comfortable.